Samuel Caviezel was born in Seattle and grew up in the Puget Sound region of Washington State. He began his clarinet studies with Laurie DeLuca of the Seattle Symphony, progressed through the Tacoma Youth Symphony Association, and spent his senior year of high school at the Interlochen Arts Academy in Michigan. In 1992 he entered the Curtis Institute of Music, where he studied with Donald Montanaro. Before graduation in 1996, he joined the Grand Rapids Symphony as Principal Clarinet, returning to Philadelphia two years later to perform under the baton of Wolfgang Sawallisch. He became and is currently the Associate Principal and E flat Clarinetist of the Philadelphia Orchestra. 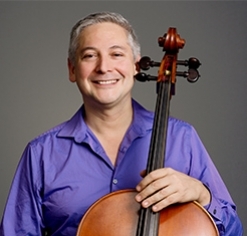 Mr. Caviezel has performed frequently at the Philadelphia Orchestra Chamber Series, and has also appeared with PCMS. He is on the faculty of Temple University, where he teaches the clarinet. David Cramer, a native of Cleveland, Ohio, attended the Curtis Institute of Music. His teachers have included William Hebert. James Pappoutsakis, and Murray Panitz. Mr. Cramer has participated in the Tanglewood Festival and the Central City Colorado Opera Festivals. 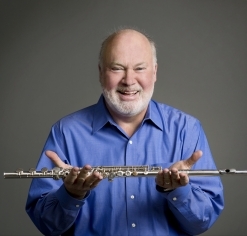 Before joining The Philadelphia Orchestra in 1981, where he is the associate principal flute, he was a member of the Montreal and Pittsburgh Symphony Orchestras. He has appeared as soloist with The Philadelphia Orchestra, the Pittsburgh Symphony Orchestra and the Haddonfield (NJ) Symphony. Mr. Cramer has served on the faculty of Carnegie-Mellon University and currently teaches at the Esther Boyer School of Music of Temple University. 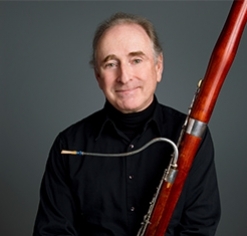 Mark Gigliotti has been a member of The Philadelphia Orchestra bassoon section since 1982. He is currently co-principal bassoon. He has also held the positions of principal bassoon with the Pittsburgh Symphony under the direction of Loren Maazel and solo bassoonist with the Hague Philharmonic under conductor Hans Vonk. He has appeared as soloist with The Philadelphia Orchestra, the Hague Philharmonic and many local orchestras in the Philadelphia area. Mr. Gigliotti has given master classes in Europe, the United States, South America, and the Far East. He is a graduate of the Curtis Institute of Music. Jennifer Haas joined the Philadelphia Orchestra during the 2001-02 season. A native of Delaware, she began studying privately at the age of three. At the age of twenty, she was a winner of the American Austrian Competition and studied at the Mozarteum. She entered the Curtis Institute of Music in 1991, where she studied with Jascha Brodsky. After graduating, she played with the Concerto Soloists in Philadelphia and freelanced in the Tri-State area. Ms. Haas has performed as a soloist with the Philadelphia Orchestra at the Mann Center and with the Utah Symphony in Salt Lake City. She has also appeared as soloist with the Delaware Symphony, the Newark Symphony, and other local orchestras. Ms. Haas has attended the Aspen Music Festival, the Lucerne Festival, and the Bowdoin Festival. She plays a French Vuillaume violin built in Paris in 1846. John Koen joined The Philadelphia Orchestra in 1990, immediately after graduating from Curtis, where he studied with David Soyer. He has collaborated in chamber music with artist such as Christoph Eschenbach, Wolfgang Sawallisch, Emanuel Ax, Joshua Bell, Stephen Hough, Chantal Juillet and Jean-Yves Thibaudet. He has a special relationship with the New Symphony Orchestra in Sofia, Bulgaria, where he appears frequently as a soloist, coach and mentor. His interests include studying languages, reading, traveling and playing with his two cats. Margarita Csonka Montanaro joined The Philadelphia Orchestra in 1963, immediately upon graduating from the Curtis Institute of Music, where she studied with Carlos Salzedo and Marilyn Costello. A frequent chamber music performer, Mrs. Montanaro is one of the founders of The Philadelphia Chamber Ensemble, having performed with them since 1977. She has also participated in the Marlboro Festival and the Philadelphia Orchestra Chamber Music Series, among other ensembles. Mrs. Montanaro was married to the late Donald Montanaro, retired Associate Principal Clarinet of the Philadelphia Orchestra. They have two sons, Alexander and Gregory, and two granddaughters. Mrs. Montanaro and her husband were enthusiastic world travelers, and she was a member of the Orchestra’s Musicians’ Tour Committee for 25 years, helping to organize the ensemble’s tours. Beginning with the Orchestra’s 1994 summer season at the Mann Center, Mrs. Montanaro assumed the position of Co-Principal Harp. In May 1994 she received The Philadelphia Orchestra’s C. Hartman Kuhn Award given to “a musician who has shown both musical ability and enterprise of such character as to enhance the musical standards and reputation of The Philadelphia Orchestra.”Mrs. Montanaro retired from the Orchestra in the fall of 2014. Violinist William Polk joined The Philadelphia Orchestra in October 2007. 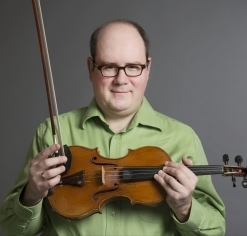 He previously served as associate principal second violin of the Minnesota Orchestra beginning in 2005. Prior to that, he was guest principal second violin of the Saint Paul Chamber Orchestra. 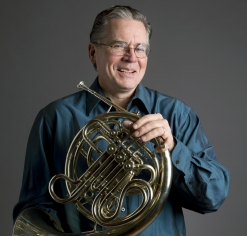 Mr. Polk has also performed as an orchestral musician with the San Francisco Symphony and the Saint Louis Symphony. 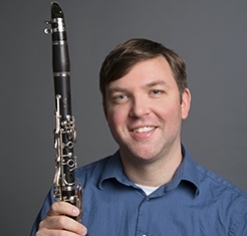 Mr. Polk has participated as a chamber musician in the Mainly Mozart Summer Festival in San Diego, California and in the Bach Dancing and Dynamite Society in Madison, Wisconsin. In January 2007, he and his wife, Kerri Ryan, now assistant principal viola of The Philadelphia Orchestra, performed as soloists in Mozart’s Sinfonia concertante with the Minnesota Orchestra. Together, they founded and performed with the Minneapolis Quartet from 2002 to 2007, and they won a McKnight Artist Fellowship in 2006. Mr. Polk attended Louisiana State University and the University of Minnesota, and his teachers have included Sally O’Reilly and Camilla Wicks. 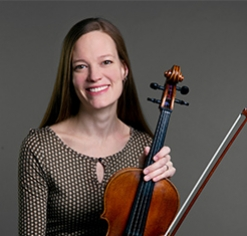 Assistant principal viola Kerri Ryan joined The Philadelphia Orchestra at the beginning of the 2007-08 season. She came to Philadelphia from the Minnesota Orchestra, where she was assistant principal viola for seven seasons. Following her graduation from the Curtis Institute of Music in 1998, she served as associate concertmaster of the Charleston Symphony. Ms. Ryan and her husband, violinist William Polk, are founding members of the award-winning Minneapolis Quartet. Michael Shahan is a graduate of the Curtis Institute (1962) where he studied with Roger Scott. 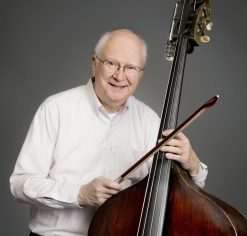 After two years in the National Symphony Orchestra of Washington, he joined the Philadelphia Orchestra in 1964, was appointed Assistant Principal Bass in 1970, and is now associate principal. He is co-music director of the Amerita Chamber Players (playing bass and viola da gamba), plays viola da gamba with the American Society of Ancient instruments and bass in the Philadelphia Jazz Quintet. He is a faculty member of the Esther Boyer School of Music at Temple University. 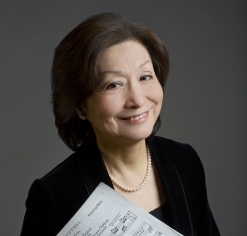 Born in Tokyo, Kiyoko Takeuti studied with Max Egger and Soulima Stravinsky, before coming to the Curtis Institute of Music, where she continued her studies with Rudolf Serkin and Mieczyslaw Horszowski. Her performing career began with solo recitals at the age of eleven, and at nineteen, she was a winner of the J.S. Bach International Competition in Washington, D.C. She performed with The Philadelphia Orchestra as a student audition winner and has appeared as soloist with many other orchestras. She has been a participant at the Marlboro and Luzern Music Festivals and performs extensively in chamber music concerts and recitals. She joined The Philadelphia Orchestra in 1985 as the orchestra pianist.